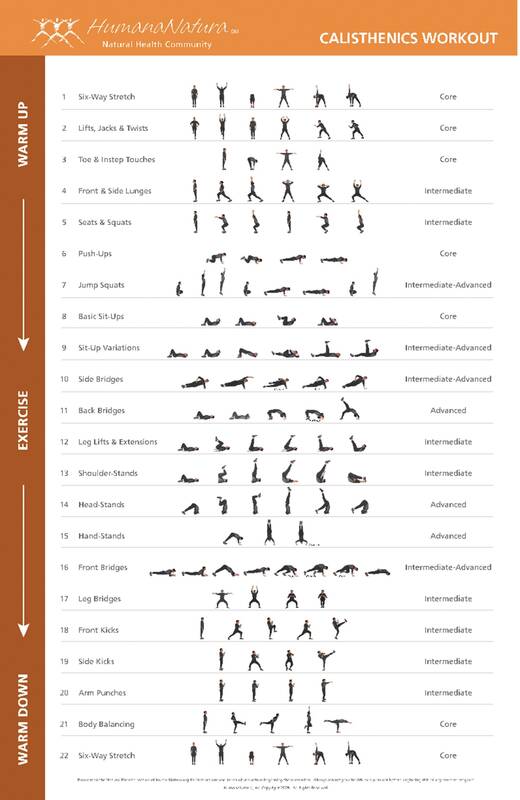 We had a request to publish a photo-based, website and social media-friendly version of HumanaNatura’s popular Calisthenics Workout Poster…and here it is! As you may know, the HumanaNatura Calisthenics Guide & Poster available on HumanaNatura’s health program website are in .pdf format, which is great for viewing, but not the best for sharing on websites and social media sites like Facebook. The poster photo to your left is a .jpg copy of the full HumanaNatura Calisthenics Workout Poster, and includes all 22 core, intermediate, and advanced exercises from our powerful natural calisthenics program. Simply click on the image for a full-sized copy and URL. Please also note that large, professional-grade copies of the poster are available via the HumanaNatura Marketplace at a modest cost, with all net proceeds helping to fund HumanaNatura’s worldwide health outreach efforts. Feel free to bookmark this page for regular access, or you can find it anytime on HumanaNatura’s NaturaLife gateway blog by searching “poster” in the search box. We all have our truths – ideas we believe to be accurate descriptions of ourselves and the world around us. This is an overall or general fact of life. But it also applies more specifically (and often more critically) to our attempts to improve our health, well-being, and quality of life. And this fact begs the question, how do we know when our health-related truths are actually true? The answer of course, as my title suggests, is by testing our truths. By this, I mean treating our health and well-being proposals as hypotheses, or as ideas or predictions that must be confirmed by objective information – and that must prove valid across varied and repeated tests of this kind. In practice, the testing of various health hypotheses takes at least three important forms: 1) research and analysis probing information that might both validate or invalidate our thinking, 2) short-term experiments that directly test key aspects of our health hypotheses, and 3) making and time-testing longer-term predictions about ourselves and the world. Unfortunately, in health as in life, we often proceed without adequate testing of our truths, with two critical consequences. One consequence is that we may live with false health ideas, and thus sub-optimally and below our potential, perhaps throughout our lives. And we may promote our ideas through our actions, encouraging others to live as we do and in less than ideal ways. A second consequence of inadequately testing our health ideas is that they naturally tend to multiply in number, and then conflict in content, since new health ideas are generally easier to create than dismiss. In many ways, this multiplicity of ideas aptly describes both the health and natural health fields today. In the name of health, we are now routinely admonished to eat, exercise, live, and relate to one another in widely different ways.